A night for the butterflies girls to get together - who would have thought it could happen to one of the weekday nights? Well, at least Tammy (founder of The Butterfly Project) made it happen for real. It was such a night to remember as she made all the girls dressed up in their little black dress and glam up for the night; catching up with each other over the 10-course fine dining meal; as well as a wonderful movie date night, which everything can be done in just ONE place - INDULGE, TGV in One Utama shopping mall. 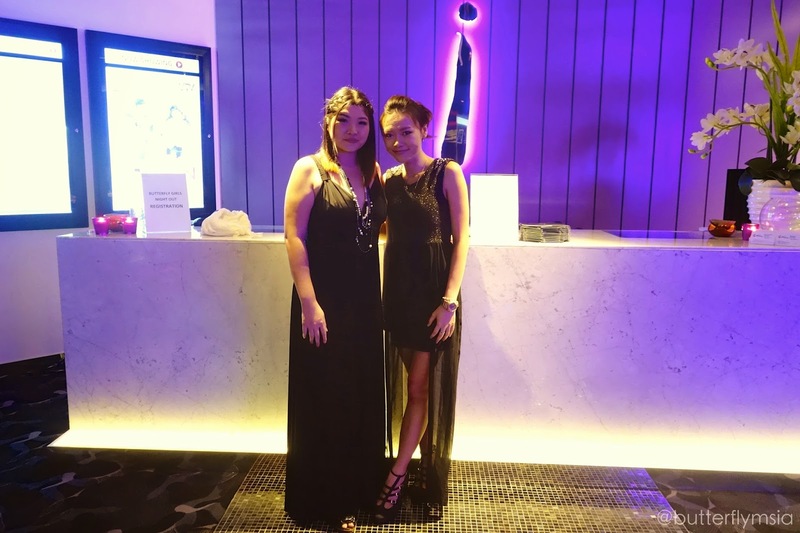 The glamourous Girls Night Out was held at none other than the newly launched - INDULGE - by TGV One Utama. It has its own private ticketing counter, lounge and dining area as well as two exclusive cinema halls that fitted with reclining chairs and personalized call-waiter-service that can accommodate 32 and 40 pax respectively. From the outside looking in, INDULGE doesn't look like a cinema at all, it more like a fine dining restaurant. It featured the rich purple and silver facade which provides a distinct element of class to the lounge and dining area, oh-so-glam! We were served with INDULGE's signature dishes for our dinner, which begins with an appetizer to the main course and ended with a sweet dessert. Shall we check them out together? We had not one, but two salads for the night. The thinly sliced smoked duck breast served with greens and simple balsamic dressings made a perfect Smoked Duck Salad! If you're not fancy anything meaty for your starter, you can give a try to their Pumpkin Salad. The rocket leaves with honey roasted pumpkin were soft with a hint of sweetness, accompanied by cherry tomato and greens, it's lovely! Moving to the main dish, we were served with three signature main dishes that made of fish, chicken and lamb! You can always opt for the Grilled Salmon that topped with lemon butter sauce, served with mashed potatoes and seasonal vegetables; or the Cajun Chicken whereby the grilled boneless chicken thigh with Cajun seasoning, served with potato wedges; or the Grilled Lamb Rack with black pepper sauce that served with seasonal vegetables. I always prefer my lamb to be done in medium-rare, which turned out perfectly well for me. *Check out the menu HERE! We were all surprised with the announcement of Best Dress Awards on that night! Again, thanks to muse by Watson for being generous with the prizes for this award. Yours truly certainly one of the happiest girls of the night for being selected as one of the winners too! Ready to enjoy the movie! INDULGE is opened from 11am with tickets priced at RM45 (meals is not included). For more information about INDULGE and to book tickets, please log on to www.tgv.com.my or via TGV Cinemas' Movie Buddy app which is available on the Apple App Store and Google Play Store.